ISLAMABAD, Pakistan - As the United States' top military official arrived in Pakistan for talks about the recent incursions by American commandos, the Pakistani military said yesterday its troops would fire on foreign forces if they crossed the country's borders but denied that this was a change of policy. The visit by the chairman of the Joint Chiefs of Staff, Admiral Mike Mullen, has been prompted by outraged public reaction in Pakistan to a raid on Sept. 3 by US commando forces, which were sent onto Pakistani soil from Afghanistan to attack Taliban and Al Qaeda militants. In his fifth visit to Pakistan, Mullen was due to meet today with Prime Minister Yousaf Raza Gilani and Pakistan's military chief, General Ashfaq Parvez Kayani, as confusion continued to swirl over a possible second incursion by US forces into Pakistani territory on Monday along the border with Afghanistan. Local residents and a Pakistani government official said Monday that two American helicopters were repulsed in South Waziristan when Pakistani soldiers fired at them. But the Pakistani and US military publicly denied any such attack, and a Pakistani intelligence official said that an American helicopter had mistakenly crossed the border briefly, leading Pakistani ground forces to fire into the air. Yesterday, the military spokesman, Major General Athar Abbas, said the army reserved the right to use force to defend the country and its people, but he said there was "no change in policy." Asked what the Pakistan military would do if there was a future incursion by American troops, he said: "There is a big 'if' involved. We will see to it when such a situation arises." In an interview aired on Pakistani television last night, Owais Ahmed Ghani, the governor of North-West Frontier province, said that there had been an attempt by US forces to cross the border into Pakistan. "My political administration has reported that an incursion took place," he said. "In the reaction, people and law enforcing officials took part." He said that only Pakistan had "a right to conduct operations on its soil. It will jealously guard its right and will not tolerate" incursions. Mullen flew to Islamabad, the Pakistani capital, from Baghdad, where he attended a ceremony handing over the United States military command of the war in Iraq from General David H. Petraeus to General Ray Odierno. Tensions in Pakistan have been mounting since the United States intensified its campaign in Pakistan's border areas against militants suspected of having ties to Al Qaeda and the Taliban. The United States has become increasingly frustrated that the militants use the border areas as a refuge to stage attacks against American and NATO soldiers in southern Afghanistan. On Sept. 3, helicopter-borne American special operations forces made their first publicly acknowledged ground operation on Pakistani soil, when they attacked Al Qaeda militants in a Pakistani village near the border with Afghanistan. Following that raid, Pakistan's military chief, General Ashfaq Parvez Kayani, said that his forces would not tolerate such incursions and would defend the country's sovereignty "at all costs." The raid complicated relations with the new civilian government in Pakistan, which is trying to stabilize the country after the resignation in August of President Pervez Musharraf, whom the Bush administration regarded as a strong ally in its campaign against terrorism. But the administration has criticized Pakistan in recent months for not doing enough to curb attacks by the Taliban and Al Qaeda, which keep bases inside the Pakistani tribal region and cross the border to attack American and NATO forces in Afghanistan. According to senior American officials, President Bush secretly approved orders in July that for the first time allow American special operations forces to carry out ground assaults inside Pakistan without prior approval from the Pakistani government. The Pakistani leadership has warned that the American attacks on Pakistani soil threaten to undermine the country's democratically-elected government. On a visit to Britain yesterday, Pakistan's newly elected president, Asif Ali Zardari, was quoted as saying after meeting with British Prime Minister Gordon Brown: "This situation doesn't help democracy." When asked about future cross border attacks, Zardari said: "I don't think there will be any." In a meeting in Islamabad yesterday with Jack Straw, the British justice secretary, Gilani said that Pakistan's sovereignty had to be respected. According to a press statement by the Pakistani prime minister's office, Straw said that he "hoped that Pakistan would continue providing passage to NATO convoys through its territory on their way to Afghanistan." 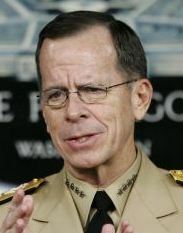 Admiral Mike Mullen was due to meet today with Prime Minister Yousaf Raza Gilani and Pakistan's military chief.